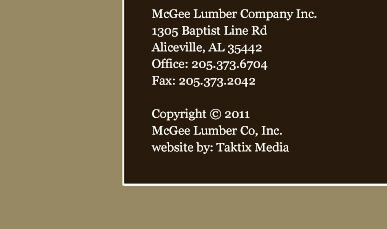 McGee Lumber Company, Inc. - Constantly striving for excellence in the Hardwood Lumber Industry. 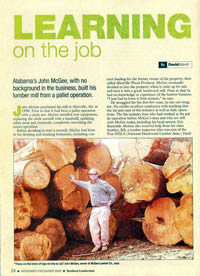 John McGee purchased his sawmill in Aliceville, AL in 1990. John had little knowledge at that time but thanks to hard work, determination and possibly some of the best employees in the industry, McGee Lumber Company, Inc emerged & has thrived in the hardwood market. A dry kiln was added in January of 2000, second kiln was added in 2002 & in 2005 a planer and third kiln were installed.  Now McGee Lumber Company, Inc. has the dry kiln capacity of 200,000 board feet. Today McGee Lumber Co., Inc. uses state of the art sawmill equipment, employs 40 people and produces 10,000,000 board feet annually.